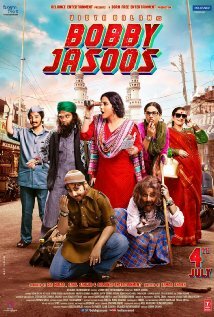 Vidya Balan shines again in Bobby Jasoos (“Bobby the Detective“). Her contrarian tomboy private investigator makes for a charming lead character whose independent spirit gets her into trouble. 30-year-old Bobby (Balan) wants nothing more than to work as a detective in Hyderabad. Rejected by a proper investigative firm, she scrapes by on minor jobs, such as steering prospective brides away from TV news anchor Tasawur (Ali Fazal), who wants to stay single but is too cowardly to tell his parents. She even extorts money from her cousin Afreen (Anupriya Goenka), whose secret affair with the goon Lala (Arjan Bajwa) would displease the family. Bobby gets her big break when a rich man, Aneez Khan (Kiran Kumar), asks her to find a young woman, with no information other than the woman’s name and the location of a birthmark. When Bobby succeeds, she gets a big payday and the name of another girl Khan wants found. But why is Khan looking for these women? Lacking formal training and an office staff, Bobby’s methods involve a lot of trial and error — and a lot of costumes. The disguise gags are cute, and Balan is passable in drag. But ultimately, Bobby solves her mysteries with her wit and not silly outfits. She’s assisted by a trio of sidekicks: restaurateur Munna (Aakash Dahiya), internet cafe owner Shetty (Prasad Barve), and mobile phone seller Sohail (Tejas Mahajan). Their friendships with Bobby are sweet, establishing her as likeable as well as talented. They also stand in contrast to her difficult homelife. Despite the support of a doting mother (Supriya Pathak) and a younger sister, Noor (Benaf Dadachandji) — who perfectly encapsulates their sibling rivalry with the line “Go die! Come back soon.” — Bobby can’t win over her traditional father (Rajendra Gupta). He’s past the point of tolerating her career ambitions, and he only wants her to get married like all the other women her age. The conflict with her father helps flesh out Bobby’s character. She’d headstrong and confident, but she’s also desperate for her father’s approval. Nevertheless, she can’t be someone she’s not. Balan is the perfect choice to portray a character who is feisty yet vulnerable, and a fine role model for girls. The film is extremely family friendly. Another selling point in Bobby Jasoos‘ favor is Ali Fazal. His subtly humorous reactions are pitch-perfect, as poor Tasawur tries to cope with Bobby’s impulsiveness while unwittingly falling for her. Fazal and Balan share a wonderful chemistry. The mystery at the center of the movie is its weakest element. It’s not particularly challenging, and the payoff is melodramatic. However, if this movie is just a setup for future mysteries starring the character Bobby Jasoos, I can happily live with it. This entry was posted in Reviews and tagged 2014, 3 Stars, Aakash Dahiya, Ali Fazal, Anupriya Goenka, Arjan Bajwa, Benaf Dadachandji, Bobby Jasoos, Bollywood, Hindi, Indian, Kiran Kumar, Movie Review, Prasad Barve, Rajendra Gupta, Supriya Pathak, Tejas Mahajan, Vidya Balan on July 4, 2014 by Kathy. Great review! This one’s on my watch-list. I appreciate all the effort to make the film doesn’t look stupid in any way. Even when the Bobby drag in guy’s costume, her sister still can recognize her (it’s believable). and I really appreciate they made bobby-tasawwur relationship blurry to the end, this give chance to Bobby stay as independent woman and not fall into a man. Before watch this film, I worries that the ‘detective’ element will be just another copy of western detective story and told in Indian flavour, but I was wrong…the cases she work in seem fits in the Hyderabad environment/community. What’s more important is the film highlight the patriarch issues and conservative mindset. since I also observing the fasting month now, its quite surprises to see the Ramadhan-related element in the first 1/3 of the film. However I’m still puzzled why the Khan guy bring the gun at the climax of the film. At first I was like “oh! he’s going to kill bobby’s friend”…but the plot twisted to other way, still, the gun is make no sense…. I’m glad you enjoyed the movie, Abdul. Great point about the climax of the story not hinging on a romantic relationship between Bobby and Tasawur. As for the gun, I didn’t get it either. Oh, well.